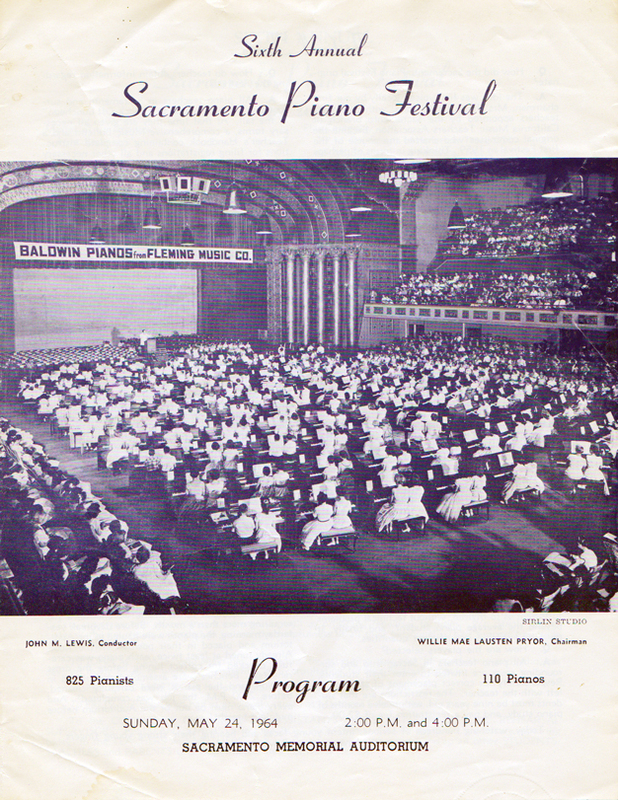 A friend of ours gave us this program of the Sixth Annual Sacramento Piano Festival that was held at the Sacramento Memorial Auditorium on Sunday, May 24th, 1964. It had 110 pianos on the floor of the Auditorium and 825 pianists participated in the event. Each piano could have two pianists sitting on each bench and thus have as many as 220 pianists playing at one time. I had never heard of the Sacrament Piano Festival. So, I tried to find more info web searches and could not find any information. 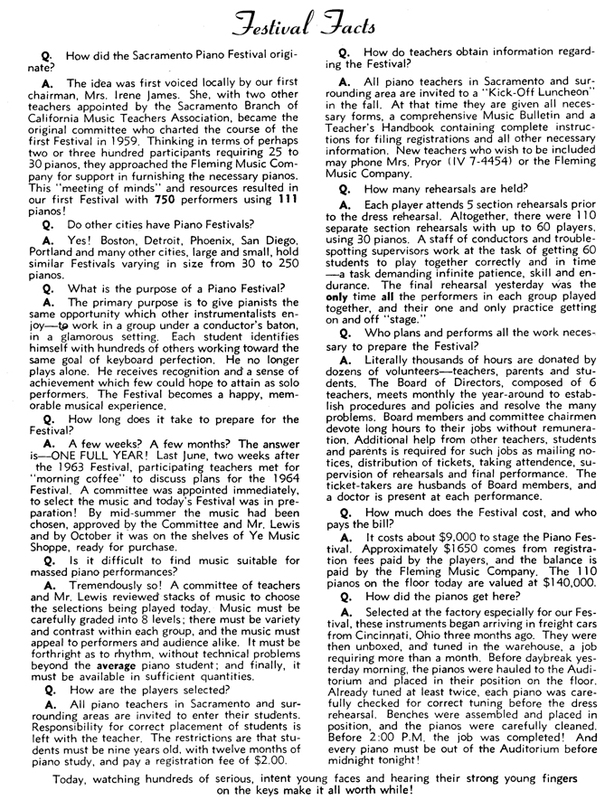 I did find that in 1964 both the Beach Boys and the Rolling Stones played at the Sacramento Memorial Auditorium, but no mention of the Sacramento Piano Festival. Go Figure. The Festival must have been as big of an event as the Stones, right? 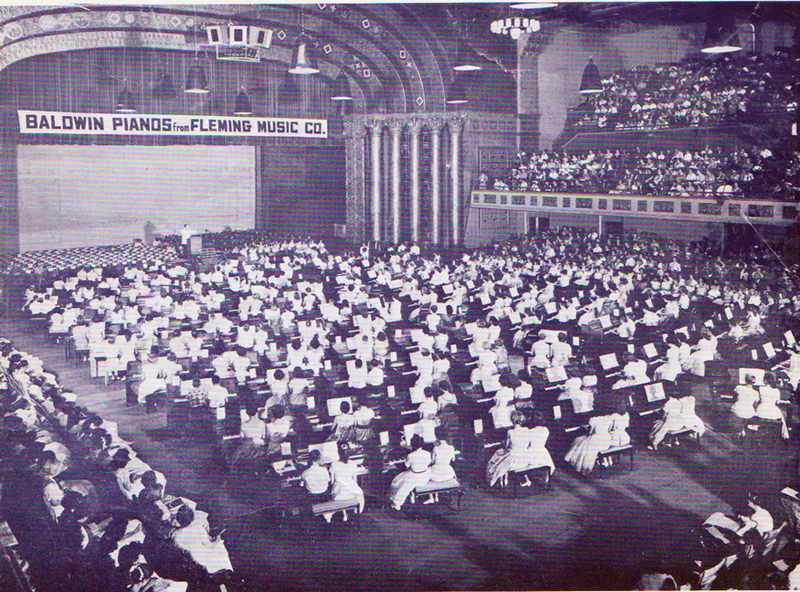 The Fleming Music Company sponsored the event, but they are no longer in business. Apparently, the 110 pianos used in the festival were available for sale right after the concert. 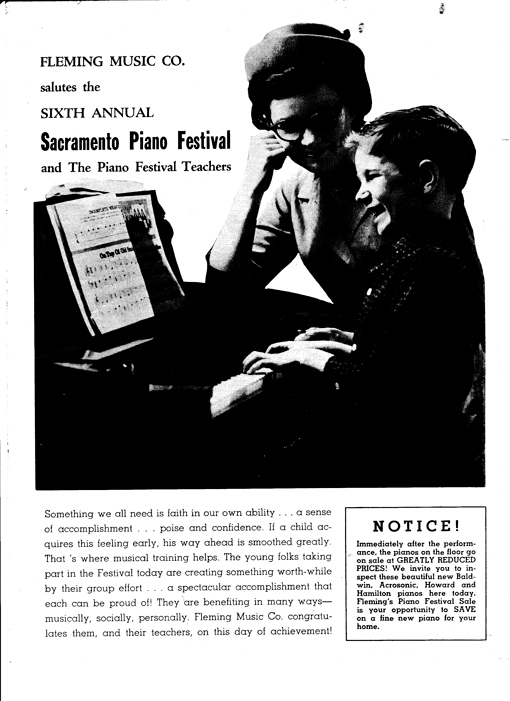 Does anyone out there remember the Sacramento Piano Festival? My friend & I played the piano in this event on Sunday, May 24 1964. We were in the ‘I’ group of the word ‘Festival’. I have this same program with all the performers names listed. What a wonderful experience My last name was Sanderson. What a surprise to actually hear from someone who was not only there, but actually preformed in the Sacramento Piano Festival. I never noticed that the different groups spelled out Festival. Thanks for pointing that out. I wished I could have heard the performances. I cannot imagine how it beautiful it must have sounded to have so many pianos playing at the same time. I bet there were a lot of rehearsals to attend just to prepare for the event. Thank you so much for your comment. I hope you still play. Was Gwen or Diane Lyons in one of those groups? It is good to hear from you. Yes, there is a Gwen Lyons listed in the program. You were in Group I. However, I did not find a Diane Lyons. Are you still living in California?